This Thanksgiving I decided to compile some of my favorite tips for how to enjoy this beautiful holiday to the fullest. I also asked two of my best friends to share their talents for this blog, and they DELIVERED!!! Robyn Youkilis gave us an amazing pumpkin muffin recipe that you will flip for, and Jamie Graber shared a Kundalini meditation for a healthy digestive system. She even recorded audio guidance that you can download so it’s super easy to follow along. Thanksgiving brings up a lot of our food issues. Maybe you tend to overdo it and feel sick, or maybe you go into old restrictive behaviors and deprive yourself. I know what that’s like. For a long time I struggled with food anxiety during the holidays. But when I started saying a simple prayer, that anxiety lifted. Thank you, spirit, for speaking through me, moving through me, and allowing me to eat with grace. Show me what to do. This moment of surrender invites a power greater than yourself to come in and offer guidance. It gives you a sense of peace and sets you up to win! Then you can mindfully choose the foods that are right for you and take each bite with gratitude. We spend a lot of our time focusing on what we don’t have and what we want to have. We dig up the past, we future trip and we dwell in stories of lack. So this Thanksgiving, start a new practice of moment-to-moment gratitude by consciously focusing on what you do have. When you find yourself thinking about what you don’t have or fixating on a goal, gently pivot your thoughts toward gratitude instead. What are you grateful for right now? This simple shift toward gratitude will reorganize your energy and raise your vibration. It will align you with the joyful energy of the Universe — thereby attracting more of what you want into your life! 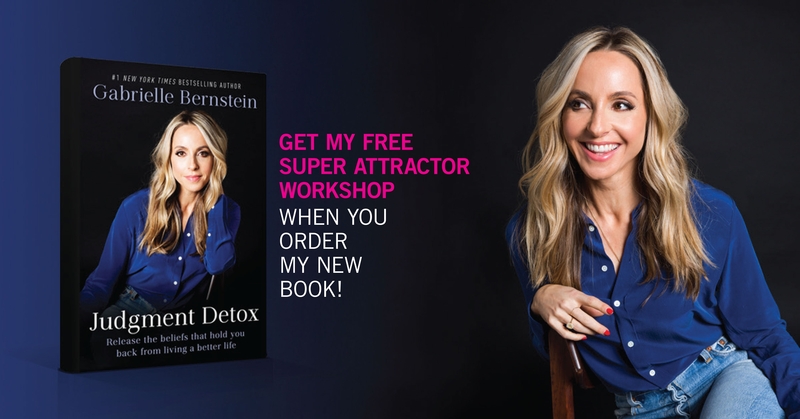 And if you want to amp up your manifesting powers even more, watch my Super Attractor Workshop! This online workshop is free when you order my book Judgment Detox. 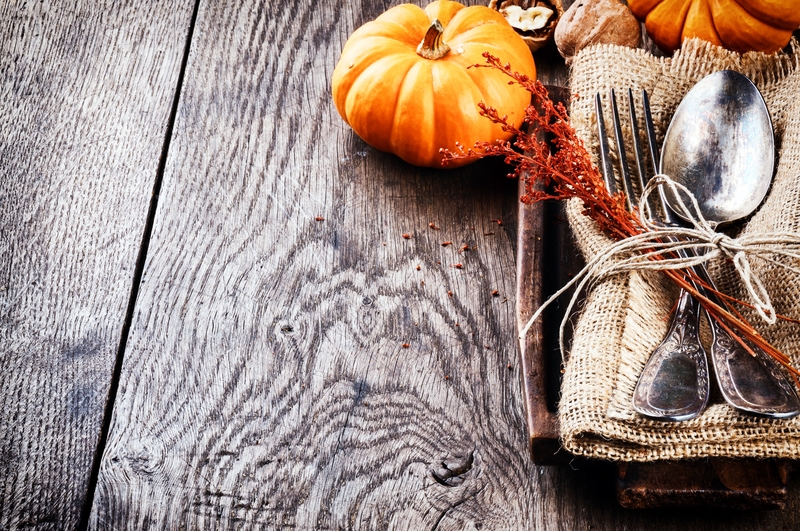 This Thanksgiving, treat your digestive system with love and have fun in the kitchen! Trying new, healthy recipes will help you feel more connected to your food and thankful for the opportunity to feed and nourish the people you love. I asked my dear friend Robyn Youkilis to share her recipe for sugar-free pumpkin muffins with our Spirit Junkie community! This recipe comes from Robyn’s book Go with Your Gut. 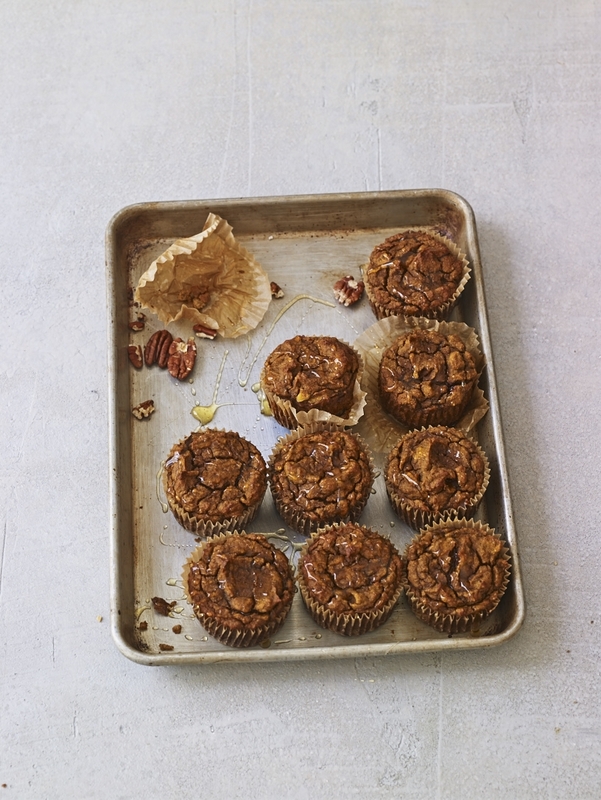 These muffins are delicious as dessert, breakfast or a midday snack. Preheat the oven to 350° F. Line a muffin pan with paper liners. Combine the bananas, pumpkin puree, eggs, almond butter and butter in a blender, food processor or mixing bowl and mix well, mashing the bananas completely. Add in the coconut flour, cinnamon, baking soda, baking powder, vanilla, sea salt and ground chia or flax and chocolate chips or nuts, if using. Mix well. Pour the batter evenly among the cupcake liners. Bake for 30 to 35 minutes, or until the tops are golden brown. I’ve always been a naturally fast eater, but I’ve learned how to eat in a slower, more mindful way that allows me to really taste and experience my food without overeating. One of my favorite ways to eat more slowly is also a great tip for Thanksgiving. It’s very simple: Talk more! Don’t talk while you’re eating (I’ve done this). Just set down your fork between bites and engage in conversation with the people you’re sharing this beautiful meal with. As human beings our meals are communal experiences, which is deeply embedded in our psychology. Instead of getting hung up on family drama, use this time to strengthen your bonds with the people around you and feel gratitude for this sacred act. My friend Jamie Graber is a detox guru and Kundalini teacher. I have turned to Jamie for many years for her wisdom on health. I asked her for her favorite Kundalini meditation to support Spirit Junkies during the holiday season, and she delivered! This 10-minute sequence is intended to be repeated three times. The full audio file is 30 minutes. But if you are short on time, going through the exercises once (10 minutes) will deliver you incredible benefits. The meditation has been adapted from KRI Teacher’s Manual. The audio file starts with a short practice known as tuning in, which involves chanting mantras in order to tune into your highest self. Then comes a 3-minute warm-up of cat cow, going as fast as you can. Jamie says, “This is good to lubricate the spine and move the energy. It adjusts the spine, strengthens the nervous and reproductive systems, and brings the emotions into balance. Download the PDF of the Healthy Bowel System Exercises and download Jamie’s audio guidance here. Being in a spirit of giving and generosity reinforces your gratitude for all that you have. More importantly, it helps those in need and serves the world. If you can give your time, volunteer with a local food bank or soup kitchen. And if you can give money, donate! Giving to a cause you care about is so empowering and helps so many people. One final note! If you need something awesome to listen to while you prep food or drive to see family, check out my talk with Arianna Huffington! I joined her on the Thrive Global podcast to talk about gratitude, self-care and a lot more. Listen here. Spirit Junkies, it’s your turn! How do you get the most out of Thanksgiving and enjoy the holiday season to the fullest? Let me know your tips around eating mindfully, practicing gratitude, cooking and more. And if you have a favorite holiday recipe, drop it in a comment! No matter what issues you have around food, you can create a healthy spiritual relationship to food and your body! Click here to learn about Finally Full, my digital course on spirituality and food. Thanks, Gabby! I asked the universe to send me a healthy pumpkin muffin recipe today and it just arrived! I don’t know that they can be replaced, unfortunately! You can Google around for banana replacements and get experimental, but I’m not sure. Agree that these muffins sound tasty. I, too, have not been much of a banana fan in the past and have successfully substituted them with other pureed fruits like applesauce, sweet potato, and butternut squash. I think sweet potato could have a similar density in this case and pairs nicely in terms of sweetness, too. If you go with a more watery puree like apple, you may have to compensate for a slightly more liquid consistency with a tablespoon or so extra ground flax or coconut flour. Generally speaking, I find muffins to be fairly forgiving when swapping out banana so long as you honor this part. Perhaps we should experiment and share notes after. Ha! Happy Thanksgiving to all. You could try applesauce or avocado. I’m grateful for this advice Gabby. I am happily surprised to find so much good stuff in one place – the healthy recipe (with butter and eggs – thank you), the slowing-down, the gratitude, the surrender – all of it. It’s what I find in the Buddhist readings I’ve been doing over the last few years. I am forwarding your message to our family newsletter. Thank you. And have a quiet, mindful and delicious Thanksgiving dinner. I love this. Happy Thanksgiving to you. It sounds so simple, but I love the whole “put the fork down in between bites” suggestion… maybe in between every other bite? 😉 I’m intending to be so much more present with each person in my family this year than I have in past years. There’s lots of connection waiting to happen! Thank you! Hi Gabby! Thank you for this. I am so grateful for all of your spiritual guidance you so willingly share and that your friends share as well! I cannot wait to try this recipe out! I’m practicing gratitude for all I have been graced with by volunteering to feed the homeless on Thanksgiving Day. I am more concerned about Christmas as food can be an issue but at the moment I’m eating for comfort had bad experiences and my body been out of physical action feel lazy I guess haha. I am trying to find something that works and that was smoothies can you do recipes for smoothies Gabby please. There are plenty of reasons to eat, including comfort. Follow your intuition and do what’s right for you. When it comes to smoothies, I turn to my girl Kris Carr! Check out her recipes for juices and smoothies here. Thank you Gabby this is awesome! Instead of doing “no shave November” I am doing”No sugar November!” All of your posts inspire me to be and I have even started my own blog thanks to you! (If you wanted to check it out, Iknow you are busy: https://www.positivelyallie.com/). Thank for your wisdom! Thank you, soo refreshing ! I know it’s not the topic and I feel I should just be thankfull, but how can you ask the universe for clear direction about a decision making problem. For exemple, a job incertainty … I have ask to meet in person or have strong clues on where to go but I have not. I don’t even know what sign I can ask for … have you an idea ? or the ones I have seen so far. Thank you also to everyone who gave love today and continue to support each other with ❤️. Thank you for sharing. I could use some mindfulness around eating this Thanksgiving meal and to slow down when I’m eating. Have a wonderful Thanksgiving!